May 17th, 1995 (1850 hours) - ABLE-3 crew, Ed Sergott and Todd Jager, responded to a report of a person who commandeered a tank from the National Guard Armory in Linda Vista. The crew videotaped the unusual pursuit as the tank drove through and destroyed most anything in its path. The crew used the helicopters PA system to warn the citizens to stay out of the way. 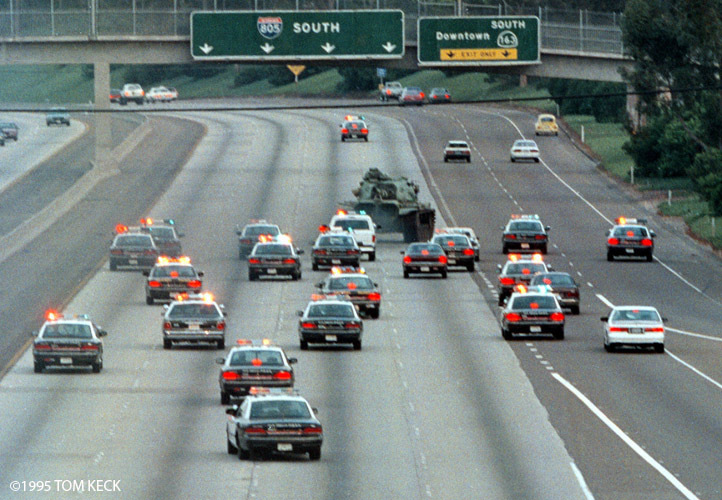 Once the tank was stopped on SR-163, the air crew picked up an officer to photograph the extensive scene.